Arty for short. One look at that face and I was smitten. 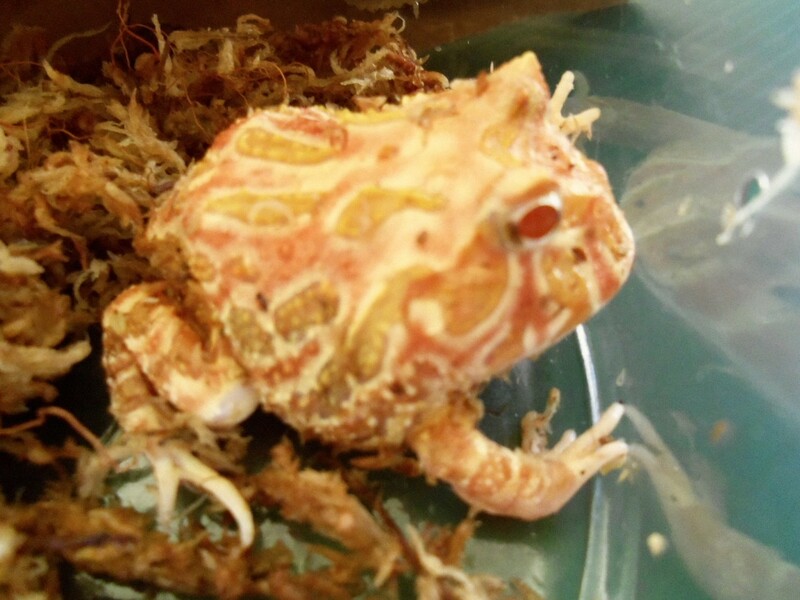 Arty is a Strawberry Albino Pacman Frog. How many pets can boast gold eyes and red pupils? He's not loud or overbearing. He needs no litter box, nor does he have to exercised, trained, or shod. Doesn't shed or scatter debris around. Ideal pet! Great listener, too. Why these creatures are not more popular, I don't know! 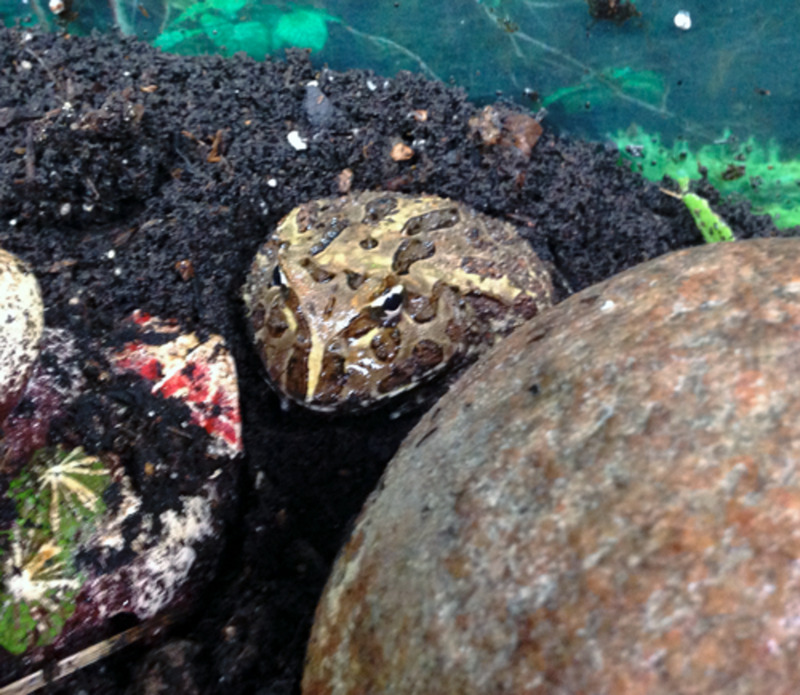 Arty is a Pacman Frog, Ceratophrys Cranwelli. Some call him the Cranwell's Horned Frog or the Chacoan Horned Frog. Horned Frog breeders have created wonderful colors of these, like the Strawberry Albino, the Apricot Samurai, the Blue Samurai. The original model is green and brown, becoming more brown with age. What is a potential Ceratophrys keeper looking at in terms of commitment? One needs room for a smallish aquarium. Many references say a 10 gallon tank is fine. Arty has a 20 gallon. He implied to me that a little extra room for creative decor would be fine. And he does like to take the occasional night time spin around the tank. 1. One Horned (Pacman) Frog (ONE only per tank. Keep these guys alone). 2. One 10 gallon or one 20 gallon glass aquarium. Petco has the 10 gallon glass tanks for about $10 with their Pals card. 3. Bedding - the best would be a brick of coconut fiber, called coconut coir. 4. Under-tank reptile heating pad. Let's say you have your tank. You don't need an expensive cover. They cannot jump all the way out. I use a simple flat cover at night to keep warmth in. Many use "coconut coir" for a bottom layer, bedding - this is neat fibrous stuff that you buy in bricks at a pet store, or eBay has it too. One adds water to it, and it turns soft and fluffy. Horned frogs like to dig around in it; also this fluffy layer can help when they want to get warmer or cooler. 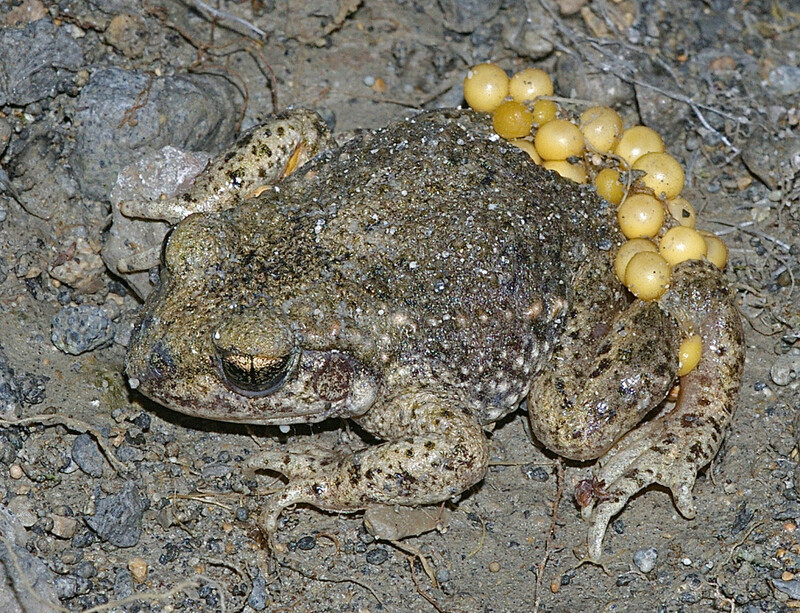 Gravel as bedding, or rocks, or sand, run a risk of getting swallowed by the frog and causing internal blockage. For this reason, keep smaller objects, rocks, etc. out of the tank. The heating pad keeps the frog's surroundings a bit warmer than most house temperatures. Ideal temperature range is about 72 degrees to 82. The cool end would be at night. 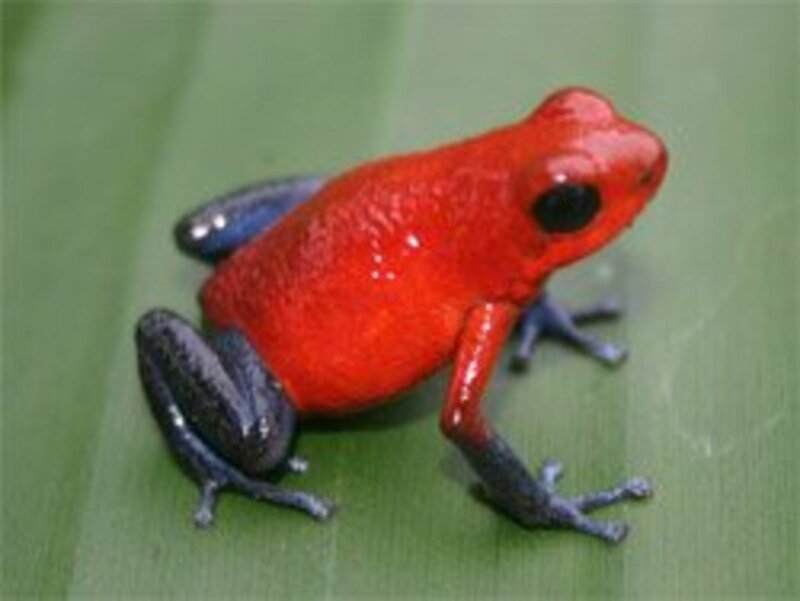 They can tolerate some variations, but they ARE tropical frogs. With the heating pad on one end, adhered to the underside of the tank, the frog can go where he wants and choose his comfortable spot. The water dish or tray could be at the other end of the tank from the heating pad. It should not be too deep. They like to soak occasionally. Arty's is heavy fused glass, handmade by some great glass artist (and found at a thrift store). Nothing but the best for Arturo! One has to keep the water clean. It's not hard. Anybody likes a little privacy once in awhile. The tank needs some object that provides cover. 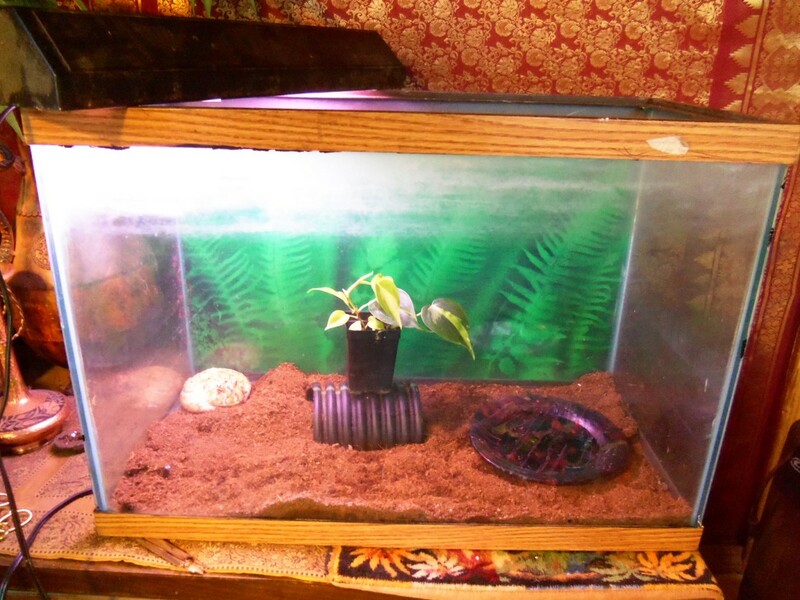 Pet stores have reptile "hides" for this, or you can make something. Right now we have a big plastic thermometer from the dollar store. Arty feels it looks hokey. But it does the job, and it's too big for him to swallow. I told him I'll keep my eye out for something classier. Rome wasn't built in a day. About the appetite. Arty definitely likes dinner time. A Horned Frog is by nature an "ambush predator". 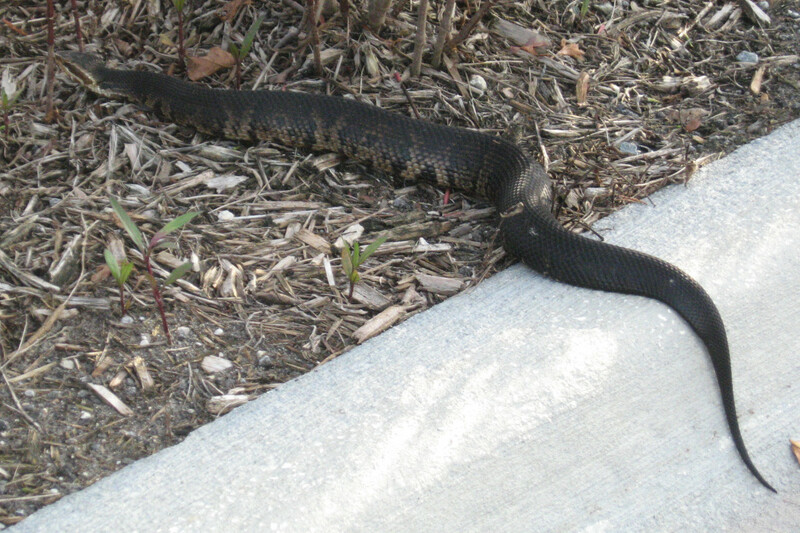 He parks for long periods of time, then jumps and bites moving prey. As far as I know, their food has to be moving. They will eat many different foods, but one has to make the items look like they're moving. Usual food items fed to Pacman frogs are crickets (feed the crickets vitamins), goldfish, frozen thawed young mice, earthworms. Arty and I never quite got the cricket technique. We tried. One person told me her frog chased crickets around the tank. This is apparently beneath Arty's dignity. I have tried impaling crickets, refrigerating them to slow them down, waving them around in front in front of him while other crickets are leaving the carton and bouncing around the living room...it's a hassle. He likes shrimp (with Alfredo sauce, shared from my dinner). I spear these on the end of a piece of uncooked spaghetti and wave them in front of him. Same with little balls made of baked salmon, or raw lean hamburger. Once per week, he gets reptile vitamins added, and once a week at a different time, he gets calcium powder added. They need a calcium supplement for growing and maintaining good bones. I have not heard of too many people feeding Pacman frogs people food. But Arty is in good health...his appetite is great...he looks ESPECIALLY smiley after the shrimp with Alfredo sauce. I would recommend, if you use people food items, nothing too "junky", no preservatives, sugar, MSG, etc. 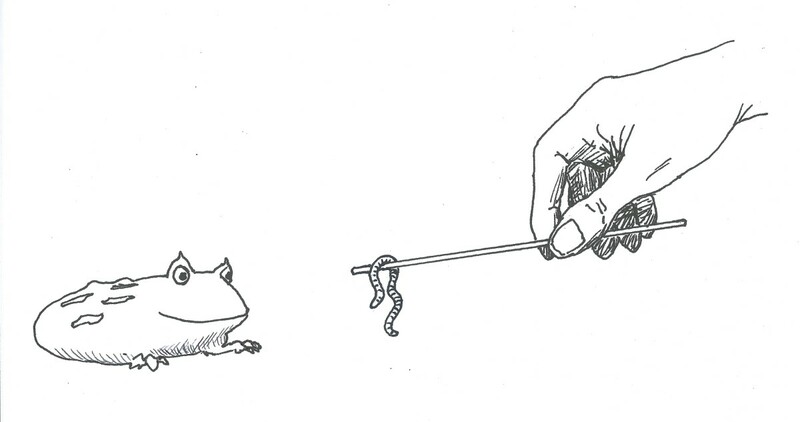 (Use common sense, and use items as close as possible to what a frog MIGHT eat naturally). ('Course with these guys, that could mean anything that moves). Another food I feed is a little ball made up of cichlid pellets, soaked til soft, then squashed into a ball, with a red worm inside. Again, I put the ball on the end of the spaghetti and move it enticingly in front of him. The mashed pellet is about like pellet dough, and holds the worm still. There are also packaged Pacman Frog foods. 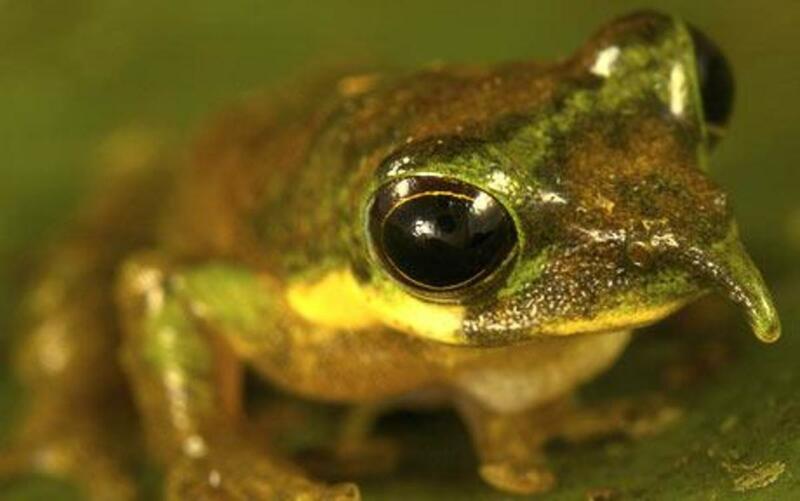 Sometimes these frogs get constipated. So if you find some frog pellets, would be good to moisten them one way or another, or not feed dry pellet food exclusively. For sure, alternate with natural foods. Earthworms are ideal. The professional Horned Frog retailer whom I bought Arty from, uses earthworms as a staple diet item. In my area, there are not many products at all, for Horned Frogs. Maybe this will eventually change. Ebay is a good option. I tried feeding food items with needle nose pliers. Didn't work so well. Arty would grab the food AND the ends of the pliers, hard enough to hang from them. The process scared him and could have injured him. The spaghetti is working reasonably well. Also I tried holding food items with my fingers. Ouch! When they've grown larger, these guys have powerful jaws and can draw blood! You can drape an earthworm over the spaghetti and wave it gently back and forth. Doesn't take long, he lunges and it's gone! If the earthworm is very wildly wiggling, the spaghetti technique can be difficult. But usually a hungry frog can get the worm pretty quickly. Some feed large mealworms to Pacman frogs. 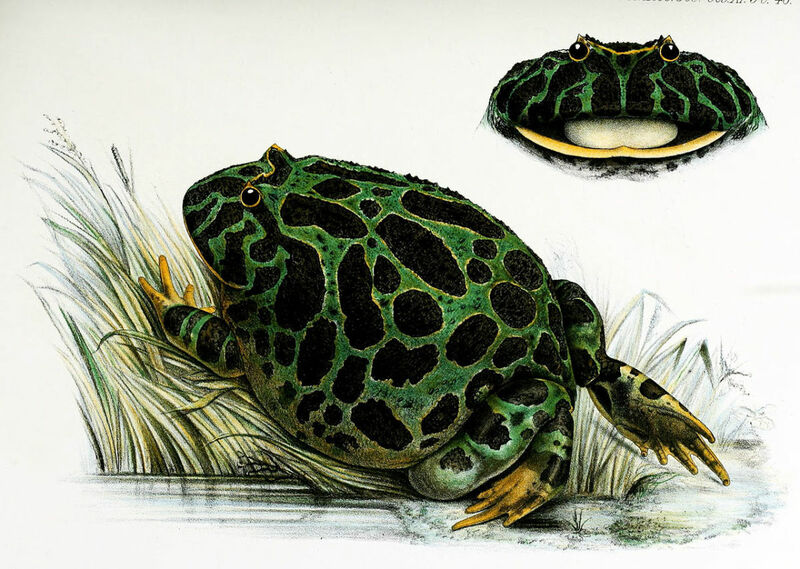 One person says to decapitate those before feeding, as they could bite the frog internally. Yuk. One interesting feature of Horned Frogs is that their saliva (?) is REALLY sticky. Like Super Glue. Must help with snatching their prey. Use filtered or distilled water for the water dish. Also, dump some water in the bedding every now and then for humidity. Seems to work for us if the tank bedding is occasionally damp in spots, but not soaking wet everywhere. Also I will occasionally spray some water into the tank with a mister. 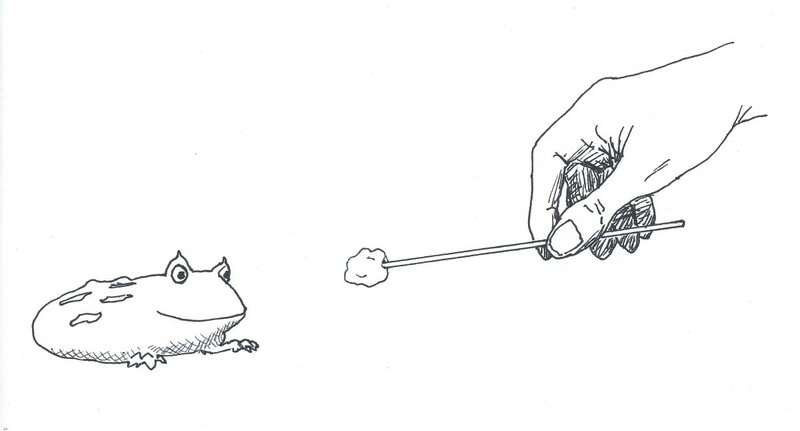 Feed young frogs about every other day. After they are 18 months old, twice a week is good. Keep the frog manure scooped out. One internet reference said these frogs are messy. I have not found this to be true. The feces are not produced all that often compared to dogs, cats or birds. Easy to scoop out the manure and throw in a bit of clean bedding in that spot. Good to keep up on this so the tank smells good and bacteria does not grow. The frog poop makes amazing fertilizer for my porch container plants! 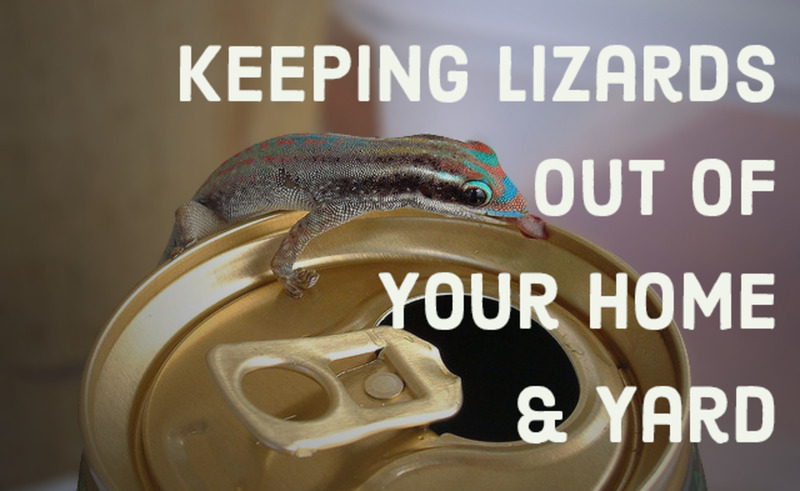 One possible drawback for some, is that Horned Frogs are not a pet to regularly handle. You have the biting thing. You can get past this, if you have to handle one. Touch him from behind a few times, he will get the idea that your hand is not food, and hopefully allow himself to be pushed or maneuvered where you want him to go. They don't enjoy handling much. As with all pets, they will stay healthier if they do not experience a lot of stress. A word of caution - these guys are best for adults and older kids. Pacman frogs are an odd combination - they can bite hard but are themselves fragile. Sometimes when they bite, they don't let go, and that's not the best thing for a child obviously. It's not too good for the frog either, if a young handler gets startled or bumps the frog against the tank or drops him. So, not a pet for small children. All in all, the care that Arty requires takes little time. In return, a Pacman frog brings a bit of the jungle to the living room. He looks exotic. His skin pattern and color is often spectacular. His face is full of oddball character, like some space alien. 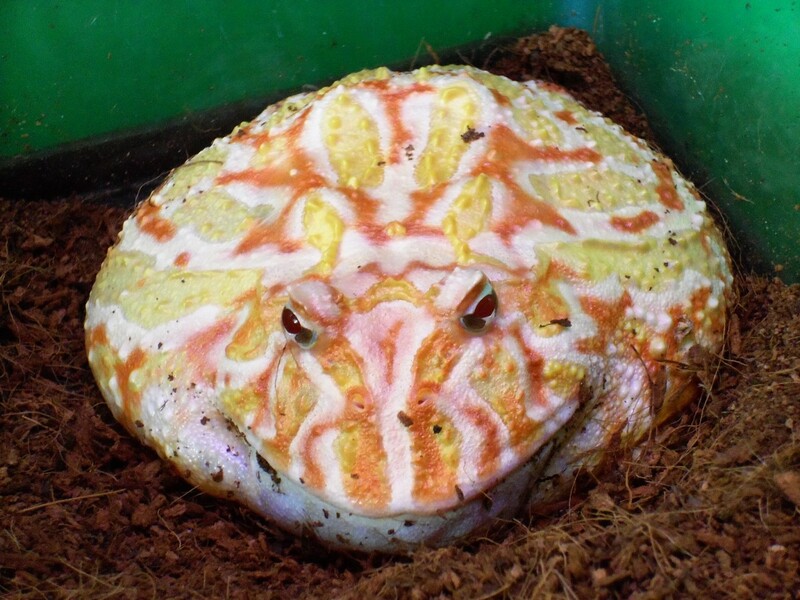 Pacman frogs can be found for sale at online reptile dealers. I have seen them at Petsmart stores, but not the unusual colored ones. I found Arty as a youngster at a reptile show in Portland, Oregon. If you get a frog, there are some good discussions about Horned Frogs at frogforum.net...heaters, problems, bedding, foods, etc. There is a book or two about them. We could actually stand more literature about them; there's not a whole lot. Arturo might be - Artyella! She keeps growing larger; girl ceratophrys frogs are larger than boys. Also, she's over a year old and has not uttered a sound (males do croaking sounds). Artyella says, "Enough yak. Show me the GROCERIES. How about my smoked oyster?" That must be the reasoning behind TCU's choice of mascot. That's a good one, about their happiness. Sure does apply to these voracious dudes! Well done, I know everything I ever wanted to know about the horned frog! Still don't know why TCU picked it for their mascot. Maybe they relate to why frogs are so happy. Nice hub page ruby, looking forward to more.